This was one of the interesting travels we had, long driving again but this time in the direction south west of Sydney. This trip had three purposes, to visit the Abercrombie Cave, to have cherry picking in Young, and to explore Cowra’s attractions. 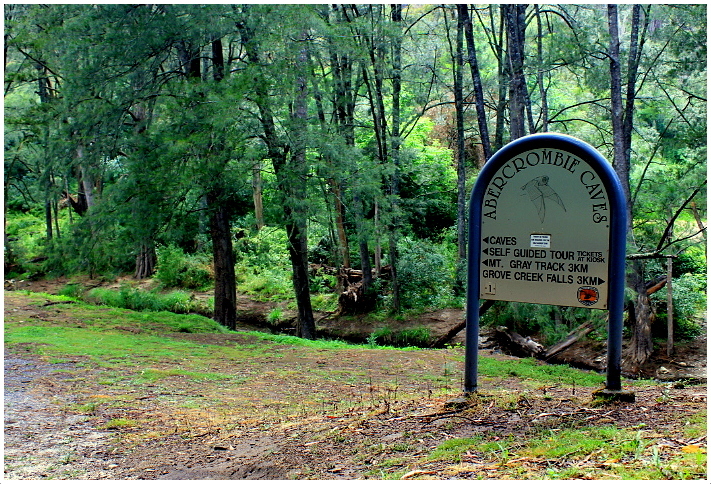 The nature reserve where Abercrombie Caves is located. Abercrombie Caves, off the Bathurst-Goulburn Road, Trunkey Creek, are spectacular limestone caves located in a nature reserve. In fact we did walk up and down a carved out path of a limestone rich mountain to reach the opening of the caves. The opening can be seen a few metres down the man-made path as if it was intentionally been hidden by huge trees from public view. 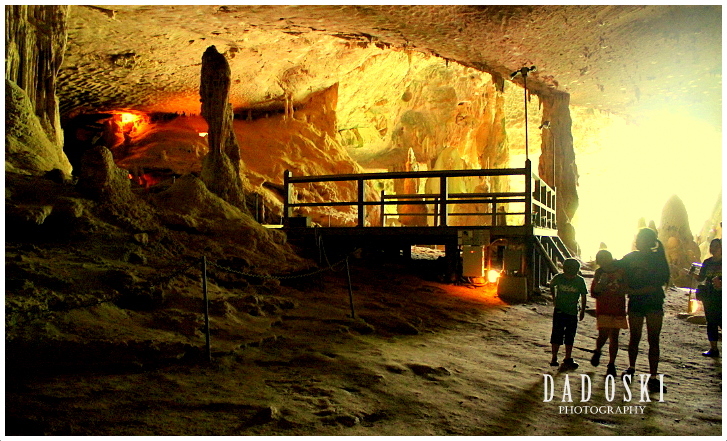 Indeed, the Abercrombie Caves are one of the most spectacular limestone cave systems in Australia. They consist of a large arch claimed to be the largest natural limestone tunnel in the Southern Hemisphere and a number of smaller passages leading from it. While the cave system is small as a whole, the Abercrombie Archway is one of enormous dimensions surpassing the size of the Grand Arch at Jenolan by two and half times. The platform built by gold miners inside the cave for dances. 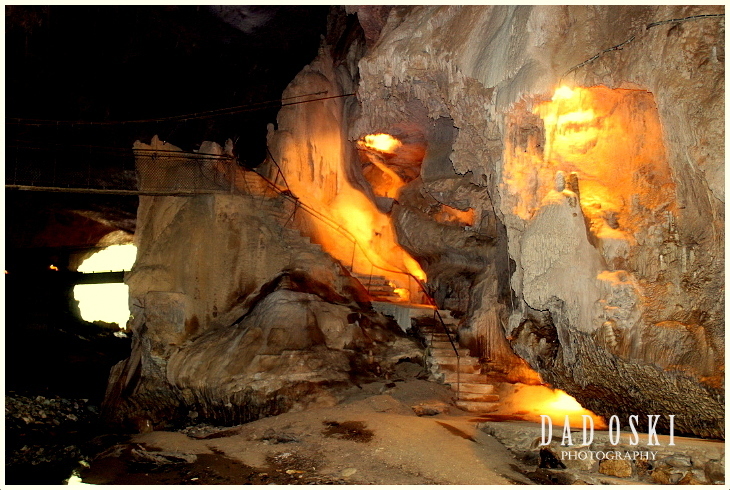 Definitely, it is one of the majestic caves I’ve seen so far with full lightings and safe accesses. More than a century ago gold miners built a platform for dances in one of the main galleries. Today the historic dance floor is used as a stage for underground concerts, weddings and Christmas carols. 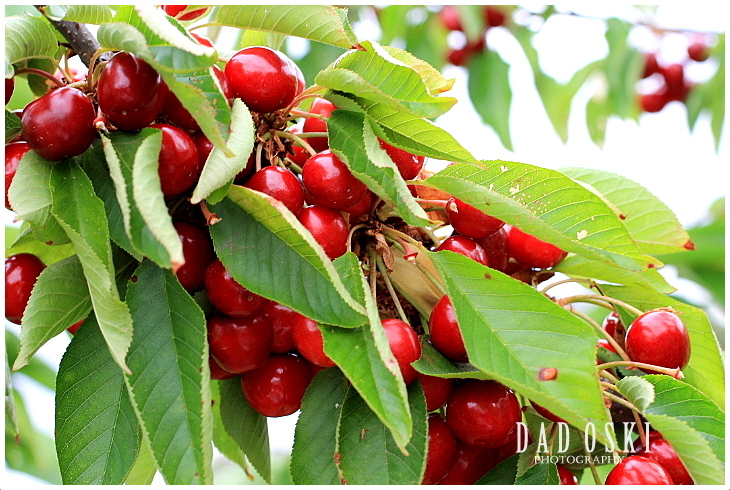 We went to Young primarily to experience cherry picking; we didn’t know that it was also their annual town fiesta. So, after the cherry picking, we were still able to watch some of their featured activities. 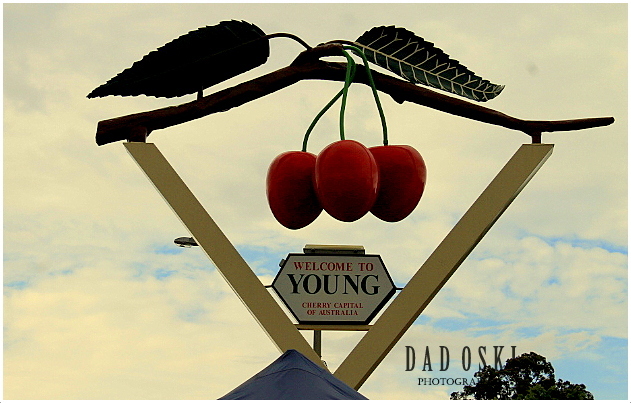 Young is situated on the South West Slopes of New South Wales in the heart of the Hilltops Food and Wine Region; Young is renowned for glorious undulating countryside, vineyards, orchards, fascinating pioneering history, exciting events and for being known as the Cherry Capital of Australia. Every year, the town receives many visitors because of their vineyards and cherries. There were two busloads of tourists when we were there and were on cherry picking at that time. The cherries were already ripe for picking, you can eat while you picked but whatever you bring out of the field in a bucket, you got to pay for it. We paid two buckets out and shared one bucket to some friends when we arrived home. 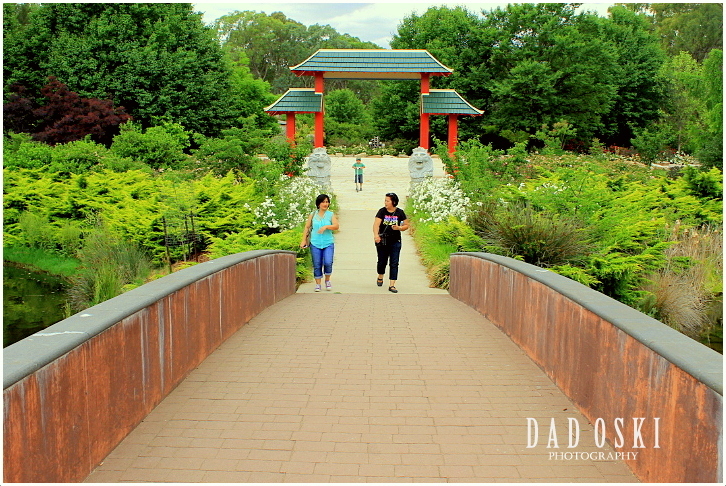 At young, we visited too, the Chinese Tribute Garden located at the Chinaman’s Dam. Chinaman’s Dam was built in the 1860’s by German brothers Herman and John Tiedmann to provide water for the sluicing of their Victoria Hill gold claims. The brothers, at some time in the 1870’s sold their area to a Chinese group who then worked on the site. 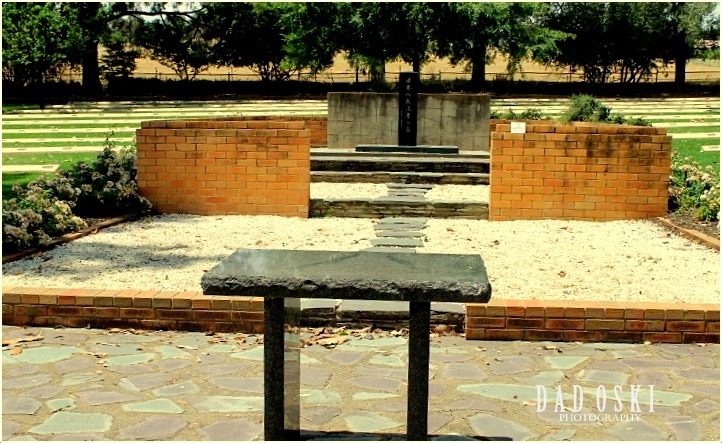 From then on, the garden had been gradually receiving transformation and many prominent members of the Sydney Chinese community also played a key role. 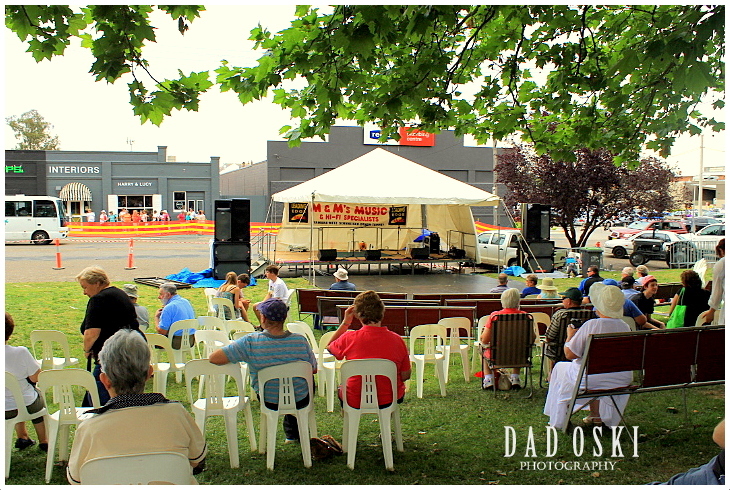 Cowra is a town in the Central West region of New South Wales, Australia in the Cowra Shire. It is located on the Mid-Western Highway, 317 kilometres west of Sydney. We passed by this town on our way to Young, and we had our sleep over here after our trip to Young. We continued to explore Cowra the following day. That day it was warm, we straight away drove to the town, where the Peace Bell is located. The Australian World Peace Bell is a replica of the one that stands in the forecourt of the United Nations Headquarters in New York. The Peace Bell was awarded to Cowra in 1992 for its long standing contribution to world peace and international understanding. 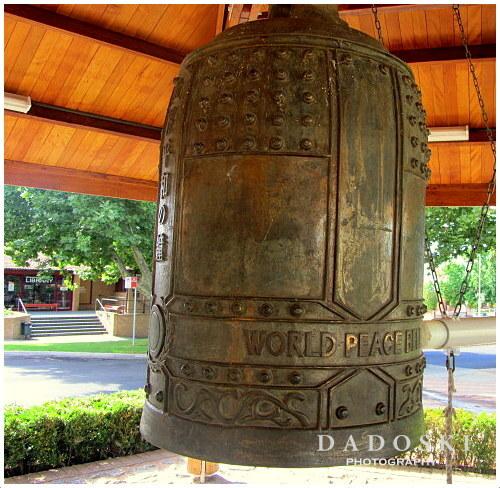 It is the only World Peace Bell in the world that is not located in a city. Some notes are provided for the visitors at the hut to understand the importance of the Peace Bell. 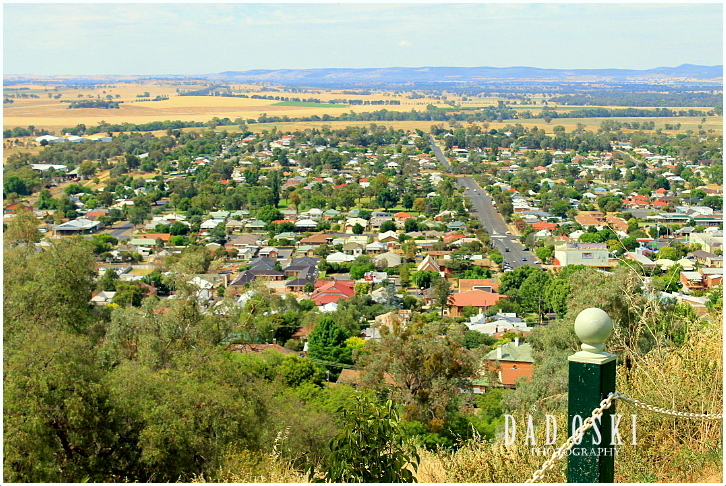 We drove next to the Bellevue Hill Lookout overlooking the scenic town of Cowra. It is a beautiful place to be! At the bottom of the lookout there are playgrounds and free barbecues with lights that come on a night for an evening barbecue. Not far from the lookout is the Japanese Garden and Cultural Centre. The garden is beautiful, fully landscaped and any visitor will definitely agree with me. The Garden’s designer, Ken Nakajima, created the Kaiyushiki (strolling) Garden to symbolise the Japanese landscape. The rocky hillside, manicured hedges, waterfalls and streams, and the two lakes provide a serene environment for a myriad of birdlife. Special features of the Garden include a Bonsho Bell, a traditional Edo Cottage, an authentic open air Tea House and a Bonsai House. All of these features contributed to the wealth of beauty the garden has. 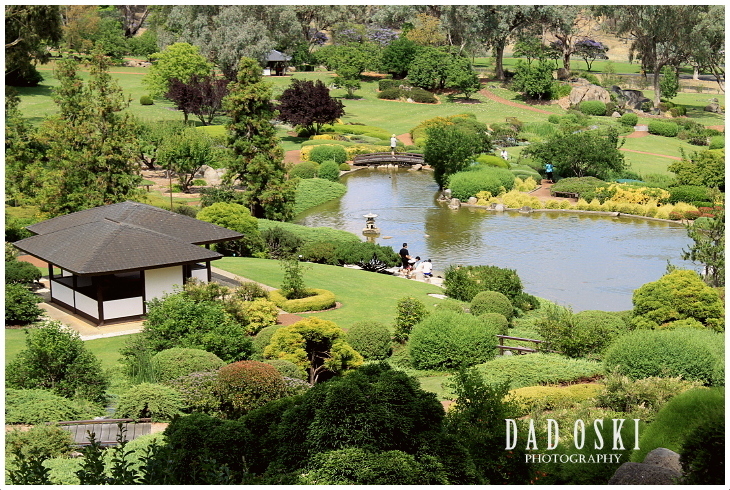 Opened in 1979, the multi award-winning Cowra Japanese Garden is a “must see” at any time of the year. 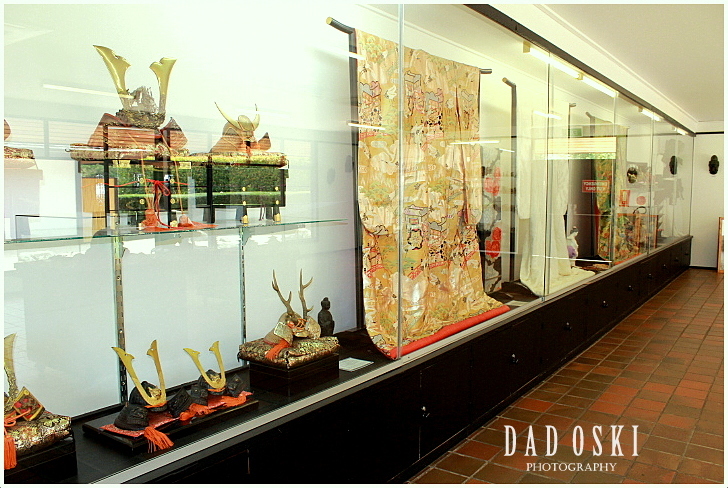 We also entered the cultural centre that showcases exhibitions of a variety of local and regional artists and has two galleries featuring an extensive collection of Japanese artworks and artefacts. These collections of arts could indeed make you feel the warmth of arts and culture of the Japanese people ranging from swords, to potteries and dolls. 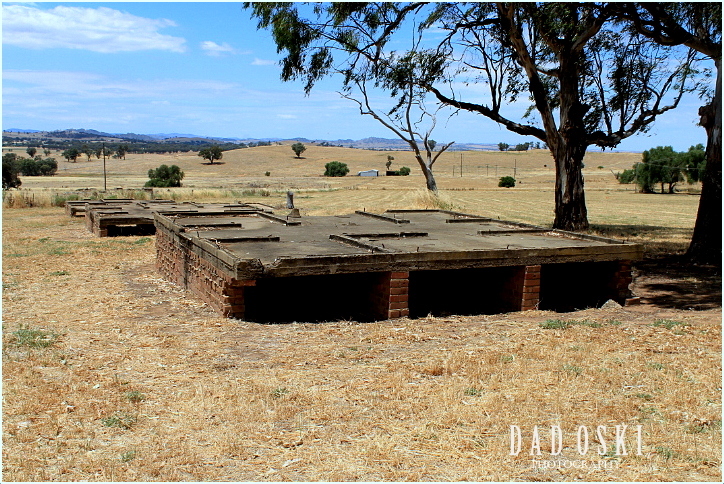 We did have also the chance to visit the Cowra POW Camp. Temperature at that time were in the mid-30s and very humid. 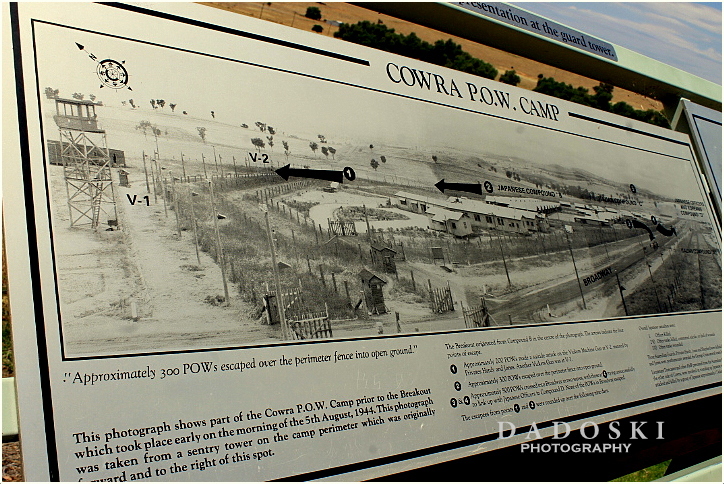 Cowra became famous because of its rich history during the World War II. 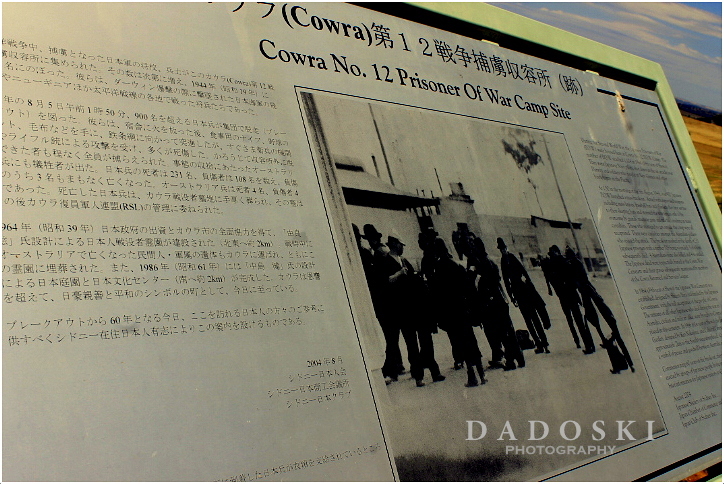 Here, the famed mass breakout of Japanese prisoners of war during World War II in 1944 took place – one of the most dramatic episodes in Australia’s wartime history. Now, there are still few remnants of the buildings that were used inside the camp and without these remnants of buildings you can’t believe that that place was formerly a POW camp. 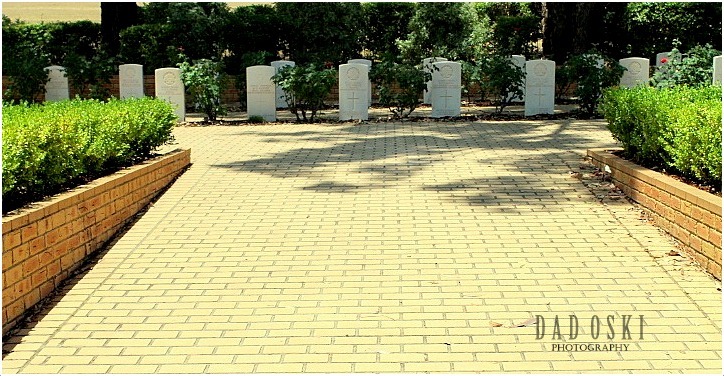 We concluded our tour of Cowra when we visited the war cemeteries which are not far from the POW Camp. Here are some photos that speak aloud of the memories of the past Cowra. The POW Camp that was then. The remains of the buildings that housed the Japanese soldiers.